April has been a busy month at Great Lakes Sailing. I visited several ports and 6 new Port Reviews were added. One port is Port Burwell on the north coast of Lake Erie. Port Burwell is now home to decommissioned HMCS Ojibwa, an Oberon-class submarine. Standing beside her at her new dry dock home, you certainly get a sense of her size. A new section, THE GALLEY, dealing with this vital aspect of boating, has been added and a Provision Planning Spreadsheet has been added to the FREE RESOURCES. Following presentations from both Canadian and United States customs authorities, there are updates to BORDERS section. (b). Want to sail on a War of 1812 schooner? 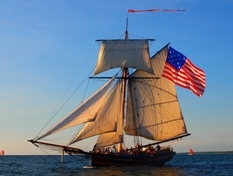 Stop by South Haven MI and visit the Michigan Maritime Museum and step on board this top-sail schooner that fought under both American and British flags. Friends Good Will was built in 1810 as an American merchant ship. In 1812, she was lured into Mackinac Island harbor and captured by the Royal Navy. She fought with the Royal Navy until Sept 1813 when she was captured by Commodore Oliver Perry at the Battle of Lake Erie. She served in the US Navy until 1814 when she was burnt in a British/Canadian raid on Buffalo. The Elgin Military Museum is located in St. Thomas, ON. In 2012, they undertook by far their most ambitious project when they acquired HMCS Ojibwa, a decommissioned Oberon-class submarine from the Royal Canadian Navy. Over the next 4 years, they overcame countless bureaucratic, technical and engineering challenges to bring her to Elgin County. Elgin County borders Lake Erie and two ports – Port Stanley and Port Burwell – competed to be her new 'home port'. In the end, Port Burwell was selected and today she towers 5 stories along the bank of Big Otter Creek. The Museum expects Ojibwa will attract up to 100,000 visitors a year to this pretty village by the lake. 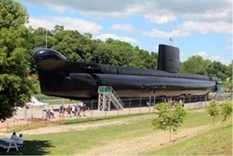 Ojibwa joins two other submarines serving as museum ships on Lake Erie – USS Croaker in Buffalo NY and USS Cod in Cleveland OH. Cruising is not camping! Some thought to safety, organization and efficiency in the galley can add immeasurably to your cruising. Whether its about safety, storage planning, provisioning or cooking, much life on a boat will revolve around the galley. As I have been assured that my talents lie in directions other than cooking, I will leave the recommendations for recipes, etc to other more capable hands. However, there is always a place for a good planning tool. I have developed a Provisioning Planning spreadsheet which is available on the FREE RESOURCES section. I recently attended a joint briefing by US Customs and Border Protection and Canada Border Services Agency. As a result, the section on BORDERS has been brought up-to-date to reflect that information. Designated Reporting Sites for entry to the United States have always been included in the BORDERS section. However, similar sites for Canada number over 200. What I have done is to list them in a separate document and added them to the FREE RESOURCES section with a link from the relevant BORDERS pages.